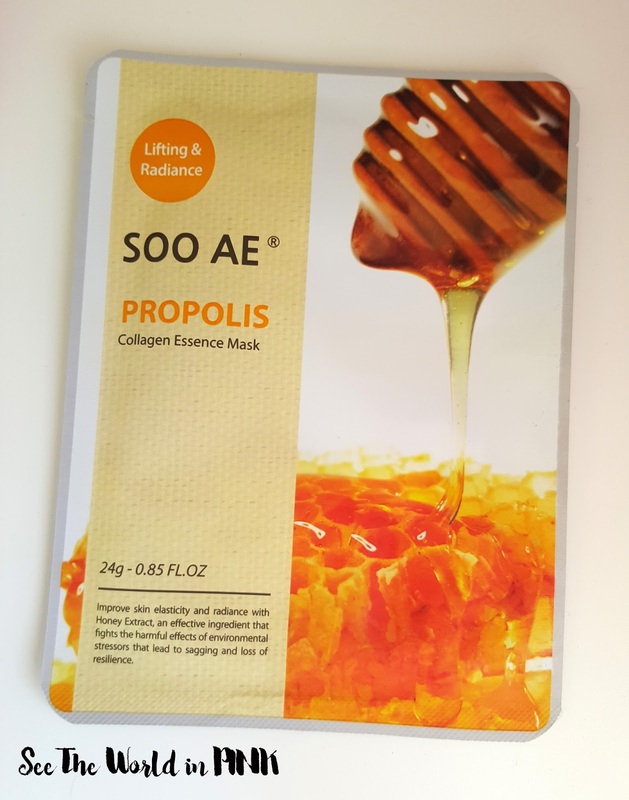 Soo Ae "Propolis" Collagen Essence Mask ~ $3.00 (5 for $15). 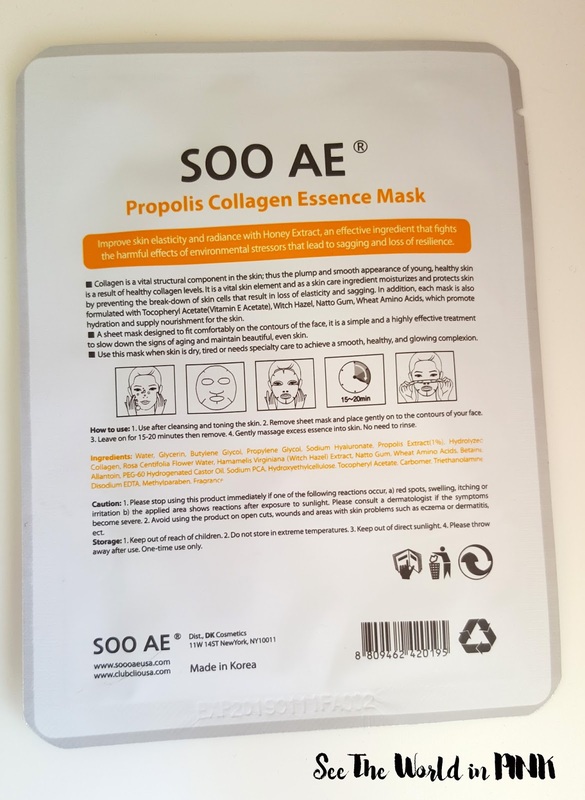 Using the highest grade of Tencel sheets infused with hydrolyzed collagen, Sooae's Nature Collagen Essence Propolis Sheet Masks are great to use for all skin types, and even for sensitive skin. Propolis, also known as honey extract, provides lifting and radiance to your complexion with anti-inflammatory benefits. Improve skin elasticity and radiance with Honey Extract, an effective ingredient that fights the harmful effects of environmental stressors that lead to sagging and loss of resilience. I just received a set of 3 of these masks in my Ipsy bag - I love trying new masks! Propolis is also honey extract and is very good at brightening the skin! 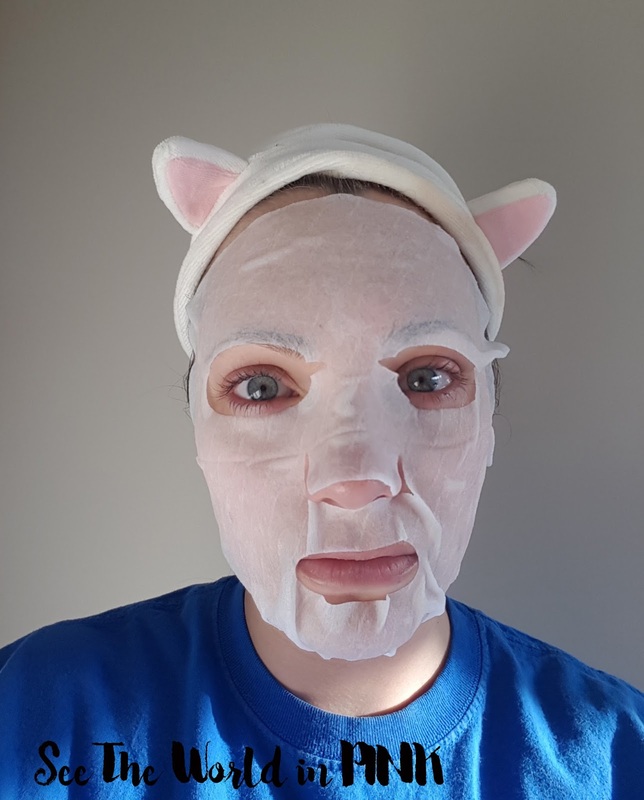 This mask is used like most other sheet masks - wash face, apply toner, unfold mask and fit to face, wear for 15-20 minutes, pat remaining essence in to skin and complete skincare routine. I thought this mask fit decent - it only had 2 tabs and I was able to fit it around my face nicely. This mask is a thicker style mask but had a good amount of essence and adhered well. I thought it had a gentle scent that smelled a little like fresh laundry or incense, but it wasn't overwhelming at all. This mask lasted for over 40 minutes on my face and still had extra essence. I thought my skin looked great after using this - I could see that it was brighter and refreshed! It was also very smooth! I am impressed! 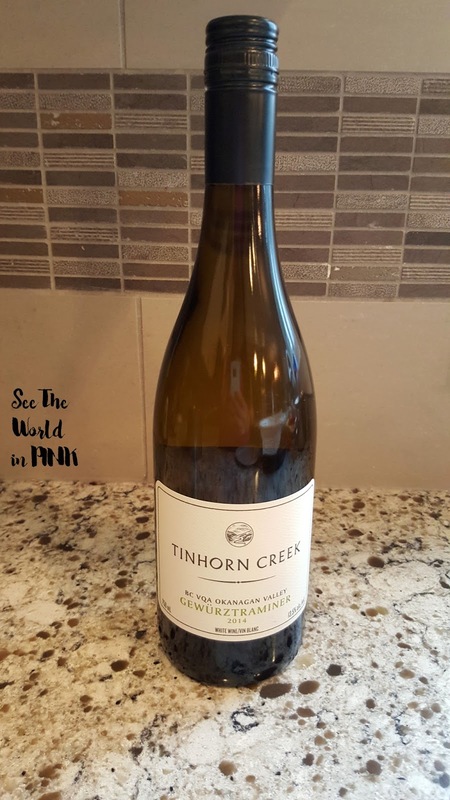 Tinhorn Creek Gewürztraminer 2014 ~ $15.99. 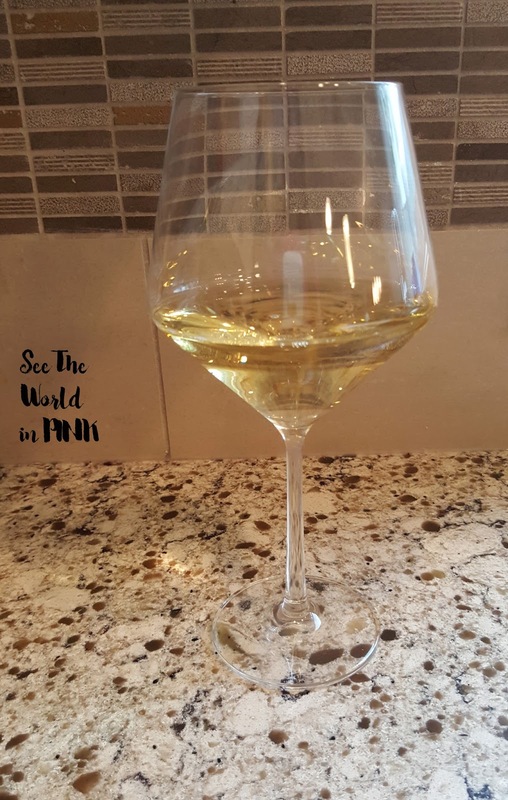 Light golden hue gives this wine a bright bold appearance. The nose is pure Gewürztraminer with lychee, guava and subtle rosewater notes. It comes at you with great intensity and has layers of fruit and spice that keep the superlatives and inquisitiveness coming. The palate is viscous and textured with great mouth feel and shows beautiful peach pie and cinnamon up front with lychee, honey and ginger, finishing with preserved lemon. There is a subtle sweetness here that gives the wine balance and a decadent richness and ensures it will develop very nicely in the coming years. The winery is located in the South Okanagan (just south of Oliver) and is absolutely beautiful! 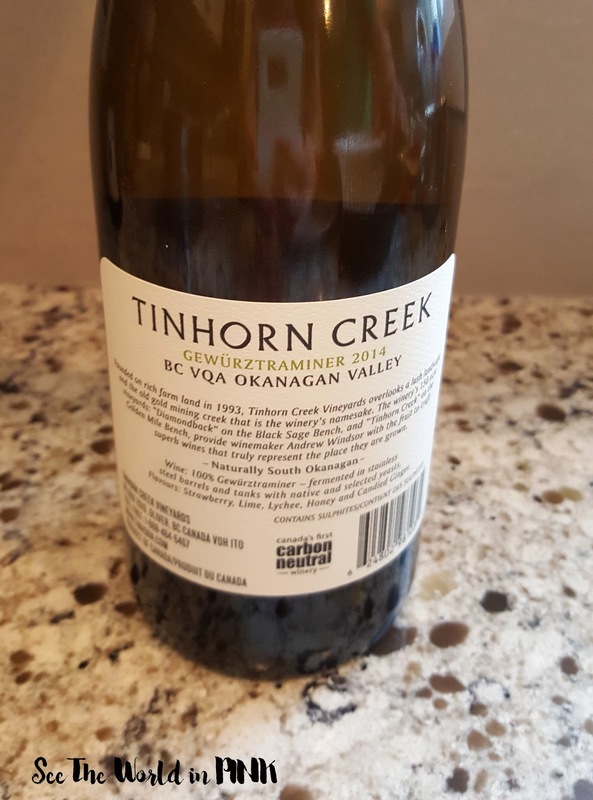 This wine is an awarded winner and is a high point earner on the Wine Review system! I just love Gewurztraminers in general so this one sounds good to me! This is a nice and light coloured wine and is delicious! It is fruity without being too sweet and finishes with a crisp but gentle note! There is no better way to describe it then perfect! This is my ideal Summer wine meaning I could have it every where!